Have your kids lined up and ready to go faster with Line Up®. 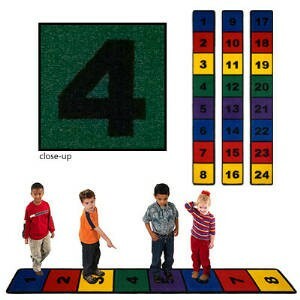 This rug comes with three strips of carpet (3'x8') and two rolls of Firm Lock® (to adhere the strips to the floor). Each block measures 13"x13". Made with Flagship quality, Line Up® comes with a lifetime wear warranty. Why Flagship Carpets? Because you can see the Quality! • Features MicroGard™ Defense against MicroOrganisms. Prevents bacteria, fungi, and yeast cell reproduction.